Bringing decades of experience to every project, S. Hanniffy & Associates Consulting Engineers is a one stop shop for innovative architectural design and structural and civil engineering solutions. We dropped into their head office in Maree, Oranmore, County Galway and touched base with director Shane Hanniffy to get an insight into this exceptional father-and-son-fronted operation. Established in 2005 by Shane Hanniffy alongside his father Sean, S. Hanniffy & Associates Consulting Engineers provide cost effective, client-friendly and efficient architectural design, civil engineering and structural engineering services across Galway, Connacht and beyond. Full Architectural, Civil & Structural design services are provided for domestic houses, housing estates, extensions and refurbishments, commercial developments and mixed-use developments, including project management and certification upon completion. Between them, the founding directors have accumulated almost 70 years of experience of design and engineering. Sean began his career in 1965 as a draftsman in the roads department of Galway County Council, while Shane – who has worked both in Ireland and abroad – graduated from NUI Galway with a B.E. Degree in Civil Engineering in 1999 and gained Chartered Membership status with Engineers Ireland. Renowned as both architects and engineers, S. Hanniffy & Associates Consulting Engineers cover a broad range of disciplines, bringing a wealth of knowledge and expertise to the residential and commercial sectors alike, encompassing architectural design; passive house design; planning permission applications, ; chartered civil and structural engineering; Health & Safety, supervision of construction works, etc. A complete design service is provided from initial concept through to the final design and S. Hanniffy & Associates offers practical, professional advice and support to clients throughout the design process. To aid in the visualisation of a project, 3D imaging can be supplied if required. Hanniffy & Associates Consulting Engineers utilise a specialised in-house Quality Assurance System, which guarantees that clients receive the highest level of quality at all times. All components of a project, including designs, drawings and documentation are produced, maintained and reviewed in accordance with in-house procedures which form part of the overall Quality Management System. At the time of writing, S. Hanniffy & Associates Consulting Engineers were working on two new housing estates in Galway. “Most of our work is in Galway at the moment, as well as into Mayo and Roscommon, although we have completed projects as far away as Clare, Offaly and Dublin in the past,” says the co-founder. 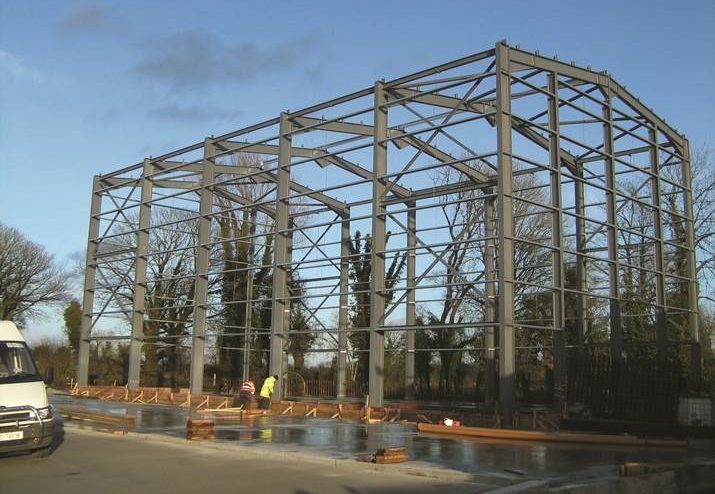 At present they are working on a new office block in Ballygar as well as providing civil and structural engineering services for an Adventure Centre in Moycullen. .
“There’s a fair bit of commercial work going on at present and the order book looks very healthy for the next year,” Shane is pleased to report. “We’ve never had any need to advertise, bar our website and Facebook page,” Shane confirms. “So it’s really through word of mouth, because of the quality of service that we provide to our clients that our name has spread. That is passed on to others and we gain a lot of work through recommendations. Which is more important – creativity or practicality? “It depends on the client. We’re doing a lot of large, modern houses, where clients like some creative thinking and imagination employed whereas other just want the basics. With commercial projects, often they want something spacious and efficient and they don’t want to spend any more than they have to.